In terms of customer satisfaction and increase of our activity in dependence on the quality of products, services and work in the organization, it is established and applied a quality management system according to ISO 9001. Quality policy is announced at our company. Quality policy is formulating the top management. It is based on the vision and strategic plans; therewith is given the adequacy of purpose and focus on the company. From suppliers of material for the production of food products we require only the highest quality, which are declared by laboratory analysis and certificates. But we check the structure of materials at the “National Reference Centre for articles of daily use and packaging materials” in an accredited laboratory SNAS no. S 096.
on plastic materials intended for contact with food. We participate in the implementation of the objectives in the program of waste management of SR, contribute to the problem solving adherence mandatory limits with material recovery rate with registering by the Recycling Fund. Our Declaration of positive attitudes towards respect for the environment is involving in the GREEN DOT. Our company began using foils that are made from renewable, natural sources such as lactic acid (PLA), which is obtained from plants – from corn starch. This film is characterized by biodegradability, which means the possibility of composting products. 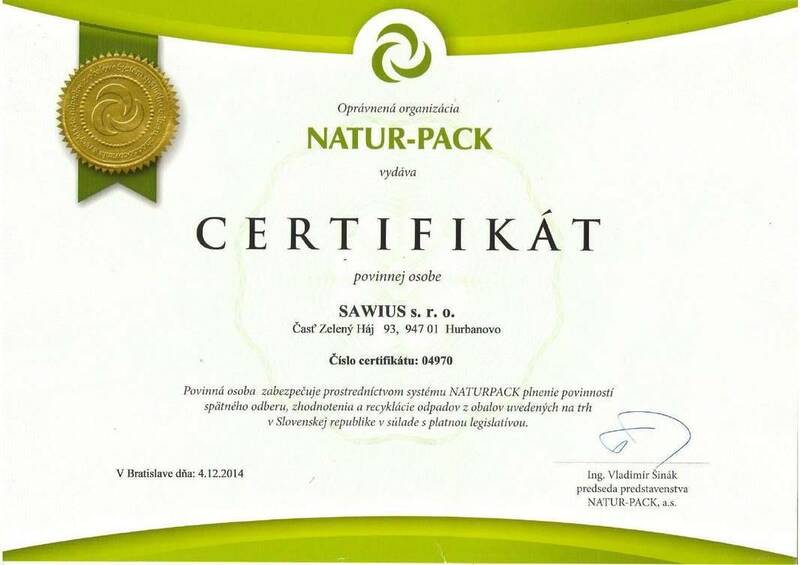 We comply with the obligation to take back, recover and recycle waste from packaging placed on the market in the Slovak Republic in accordance with valid legislation.